Wow. When I entered the small single fronted entrance of The Spotted Mallard in Brunswick I was not expecting what was waiting for me up the stairs. It felt like I had stepped into a time warp taking me back to the 1920's. The grand room was set out with a semi circular seating arrangement with the stage, where many a live performance has and will play, as its focal point. The ceiling had me intrigued with two stained glass domes, scattered collections of lampshades, a couple of shiny silver disco balls and a couple of chandeliers. 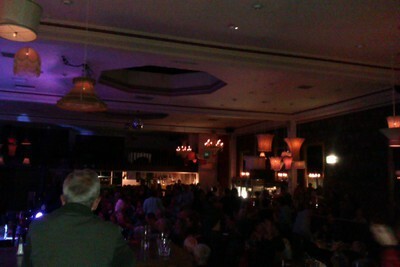 In the words of Lionel Ritchie, I really wished I was dancing on the ceiling. The walls are carpeted with fabulous black and white or red and white detailed designs so I could have danced on the walls as well. I felt important to be attending a gig at this very grandiose venue. There was staircase leading up to a tabled balcony overlooking the whole room but unfortunately this was reserved for the band and their support team. Understandably so, as the band was the reason we were here. On the opposite side of the room there was a landing that was a couple of stairs high and, although the view wasn't the best with the audio equipment in the way, you could still see some of the band side on. Going out the door from the landing took you to a balcony that overlooked Sydney Road. It was a great view and the view on the Spotted Mallard wall wasn't so bad either. 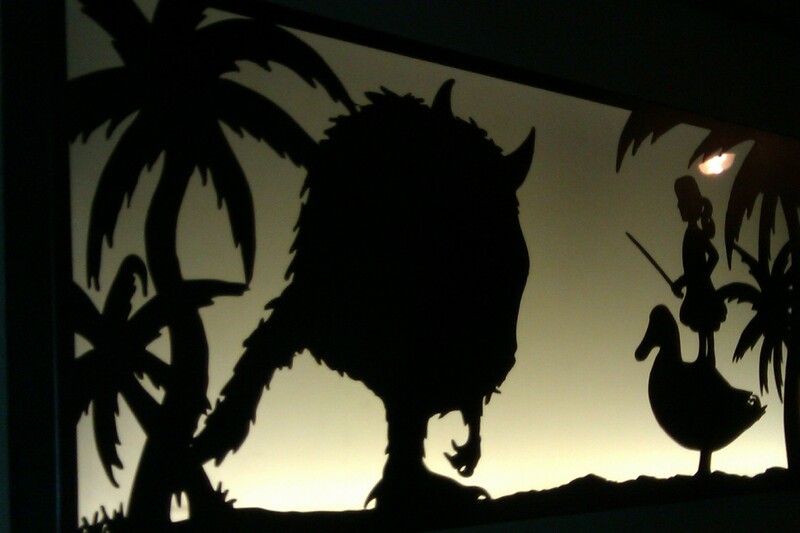 Shadow puppet-like image on the external wall of The Spotted Mallard. In the interests of keeping it fresh for consumers, the Spotted Mallard have over 15 rotating beer taps and they try to have a variety of styles on offer such as Scotch Ale, Saison, Brown Ale, Witbier, IPA, Pale Ale, Biere de Garde and so forth. The wine list looks OK with wines coming from mostly France or locally. The food menu looks great with all main meals for $19, all entrees for $12, plus bar snacks and dessert. The Spotted Mallard has partnered with the Brunswick festival to play host to a number of different artists from all over the world. 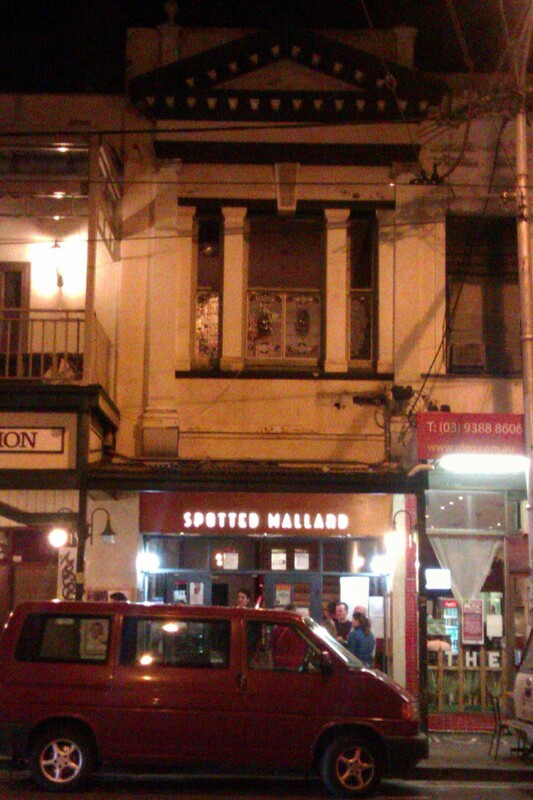 As the festival comes to a close, the musical talent at The Spotted Mallard does not, so check out their upcoming events. On Tuesday nights, its "Lets Get Trivical" pub trivia, which is free to attend and kicks off at 7:30. There is always something happening at The Spotted Mallard, so get on down to check it out. Loved your article very evocative.